When German Pinscher Ch Dabney’s Pink Gardenia “Lucy” was looking for a mate, only one beau would do, Austrian import Ch Yambo VomAwarenring “Yambo”. After a failed attempt with a different facility (not Dr. Vanderlip’s!) and a lost FedEx shipment, plans were made to drive Lucy from Portland, Oregon to San Diego so that Dr. Vanderlip could time and perform an artificial insemination (AI) for Lucy and Yambo. Over a long Labor Day weekend, with California wildfires raging, Dr Vanderlip orchestrated the AI, somehow managing three novices: Lucy, Yambo, and my husband, who filled in for me as I was needed at work. Dr. Vanderlip went “above & beyond” the call of duty, keeping me up to speed via phone and email, and making sure all elements of the breeding were successful, including some convoluted paperwork. 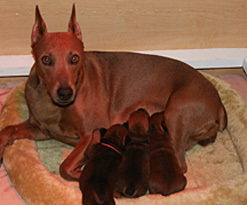 Lucy gave birth to 3 beautiful German Pinscher pups, 2 girls and the sought after male. This litter is the 4th generation of CHIC eligible GPs. I can’t thank Dr. Vanderlip enough for the successful litter, for “pinch hitting” for me, and for taking the lead on paperwork and ownership details that were challenging to say the least. I certainly will be consulting Dr. Vanderlip for the 5th generation CHIC litter! *Lucy is owned by Janet Oatney and Linda & John Krukar of Dabney Dobermans and German Pinschers.